Last week on the car radio I kept hearing this ad for a “solar energy” system for your home. Anyway towards the end of the ad they say “call for a quote on your solar system”. So I can purchase my own private solar system? Do I get to pick my planets, and constellations or are there set packages? It just struck me as funny. While driving home from PA 2 weeks ago, I saw a road sign that said “Keep a safe distance when following”. I understand the principle behind that and I am sure it is true while driving. But I got to thinking about my spiritual walk and being a follower of Jesus. After pondering that for a few days, I came to the conclusion that sometimes I “keep a safe distance when following” and I probably shouldn’t. I have discovered a couple of ways to guarantee that the traffic jam you are caught in will start moving. The first way is deciding to put hand cream on your hands. As soon as the lotion is on your hands but before you can rub it in, the traffic will start to move. 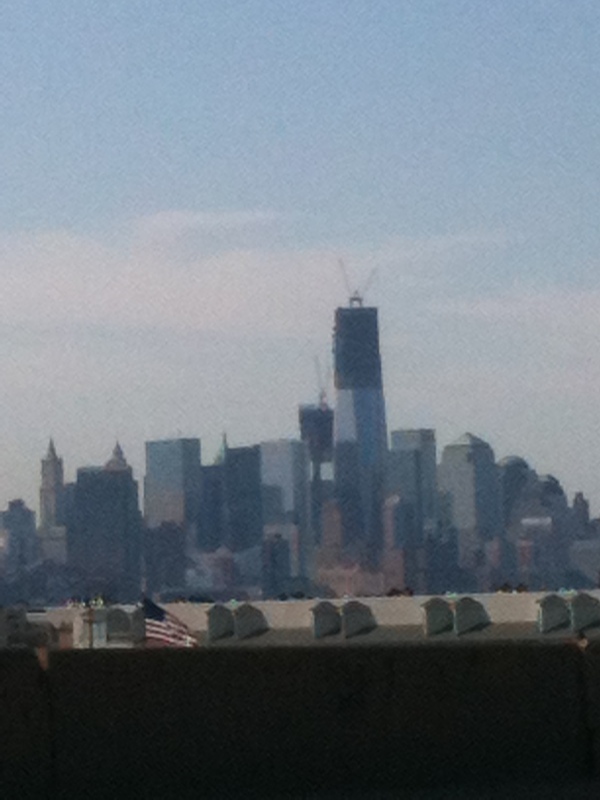 The second way is deciding you want to take a photo of 1 WTC. Open your window, get ready and as soon as you go to hit the button the guy behind you will honk. Works every time. The house that is being sold wasn’t my only childhood home but it was the one I lived in from third grade until I got married. I have a vague memory of sitting on the side steps of our house in Salt Lake City and crying because I didn’t want to grow up. Before that I had lived in England and Oklahoma. I was born in Oxford, England and came to the USA when I was a toddler. My mom would say “We gave you a good start and after that you were on your own.” My Oakie dad met my British mum when he was in England during the Korean War. I remember hearing the story of my dad arriving in England on a ship headed to Germany and my dad and some other airmen got off the ship. Oops!! so they were reassigned to the North of England. I am sure there is more to that story. Anyway that is how my dad met my mom. Yesterday, my sister and I found a box of “Old Letters” and some great old photos. I am looking forward to reminiscing with my mom. When my dad’s military time was completed, we moved to Oklahoma so my dad could finish college at the University of Oklahoma (OU). My earliest memory is being handed into a tornado shelter. Years later my mom would refer to Oklahoma as “that God forsaken place”. My mom was only 24 years old when she left her family and her country and traveled to the States alone with me. My dad had “gone ahead”. She tells the story of arriving in NY and the cab driver telling her she spoke good English for a foreigner. After England, Oklahoma and Utah we moved to Phoenix, Arizona where we lived for about 2 years before moving to New Jersey. One of my strongest memories of Arizona was riding my bicycle home from school through the desert and my handle bars fell off. Yes that statement resembles “I walked to school everyday uphill both ways with only one shoe” but it is a true story. The housing developement we lived in wasn’t completely built so there was a road through the desert to the school. One day while riding home my handle bars and some other kids handle bars fell off. Luckily a neighbor drove by and helped us. Some “big kids” at school had loosened the bolts on our bikes. The house being sold has many memories of “us 3 kids” – that is what my siblings and I called ourselves. There were Halloween costumes built my dad, fun fairs organized by my mom and summer shows put on by the kids in the neighborhood. There was music by Mario Lanza – mom’s favorite and Gilbert and Sullivan operas courtesy of my dad. There were times family from England would stay with us as my parents were sponsoring them so they could emigrant to America. There was the birth of my baby sister when I was 12 years old and “us 3 kids” became 4. I like when I get home from church on Wednesday nights and it is still light out. At 8:00pm in the winter it is dark but this time of year the sun hasn’t set yet. It seems like I have more time. Once while I was teaching a kindergarten ballet and gymnastics class a concerned student stated “Miss Ann, I think you have kept us at dance too long because it is dark out”. After a quick lesson on the concept of changing the clocks and reassuring her that mom would arrive to pick her up at the regular time, class continued. A side note: when I was in Alaska, the time change and the extended hours of light were annoying. I never knew what time it was. But usually I enjoy the extra hours of daylight especially when I am driving home. Another car stops to help but I have a weird feeling about the guy so I inform the guy that we are okay and I offer to drive the woman home. “First, I have to return the gas can and then I will drive you home.” I drive to the gas station, return the gas can and then tell her I need to call my husband. This was years ago so there weren’t cell phones. There was a payphone. I call Bruce and say “I stopped to help someone and she was trying to commit suicide and you need to get her some help” So he suggests calling our pastor but I remind him that Pastor Steve is away. think, think… I ask him to go on our second line and call friends we have in Ringwood and ask them to call their pastor. So I am on one line waiting for Bruce to call friends on the second line and this woman is in my car. And it is getting dark. Long story short, I tell the woman I haven’t eaten dinner and we go to MacDonald’s where my friend and her pastor are waiting to help. My friend’s pastor speaks with the woman, suggest that she seeks professional help and offers to pay for her to go to counseling. She can’t believe that someone will pay for her to get help. He gets her contact information and says he will call her tomorrow. And then I drive her home. The whole evening was like an out-of-body experience. As I drove home I was totally humbled. I don’t usually stop when I see someone stopped on the side of the road. I usually pray for someone to help them but this particular time I guess I was the one that was supposed to help. It was a very productive day today. Not that I really did anything but things related to me got accomplished. YES, I can cross things off of the list. Lists are part of who I am. I still make lists on paper because physically crossing it off is more fun than deleting it from your smart phone. I have a dry erase board that contains the “big list”. Usually meaning it needs someone other than me to do it. There is big satisfaction in crossing those items off. And yes, I add things that weren’t on the original list that were completed because then at least something “got done”. Such as the flag pole – that was a “write in”. So exactly what was accomplished today. Well, my house was cleaned. I didn’t do that. My two wonderful friends and cleaning people did that. The laundry got washed and dried (but not folded). I did do that and plan on completing that task later. New garage doors were installed but I didn’t do that either. One of the bi-vocational pastors from church did that. I made some phone calls and sent some emails. I talked to my daughter and mother and texted my sister. And the flag pole was repaired. I didn’t do that either but I did help a little with that project. Last Winter, I realized the string for the flag pole in my front yard was broken. So I haven’t been able to fly the flag. 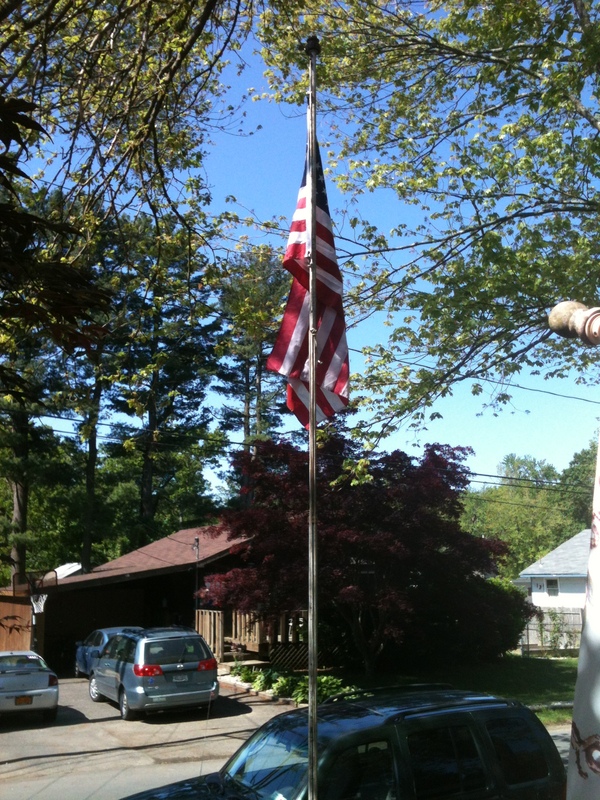 With Memorial Day rapidly approaching, I wanted to get it fixed but who fixes flag pole strings. I figured you would need a bucket truck or something similar to get the hook that was snagged in the pulley down. The other day my neighbor was outside and I asked him “who would I ask about fixing this and how could it even be done without costing mega bucks?” He said “I will work on it”. And he did. He came up with a plan. And today he and his wife with very little help from me fixed my flag pole. The tools involved were a new rope, a ladder, a fishing pole, knowledge of knots and duct tape. Amazing!! And you know what he said after the first attempt was not to his satisfaction and he redid it. “I want to make Bruce proud”. 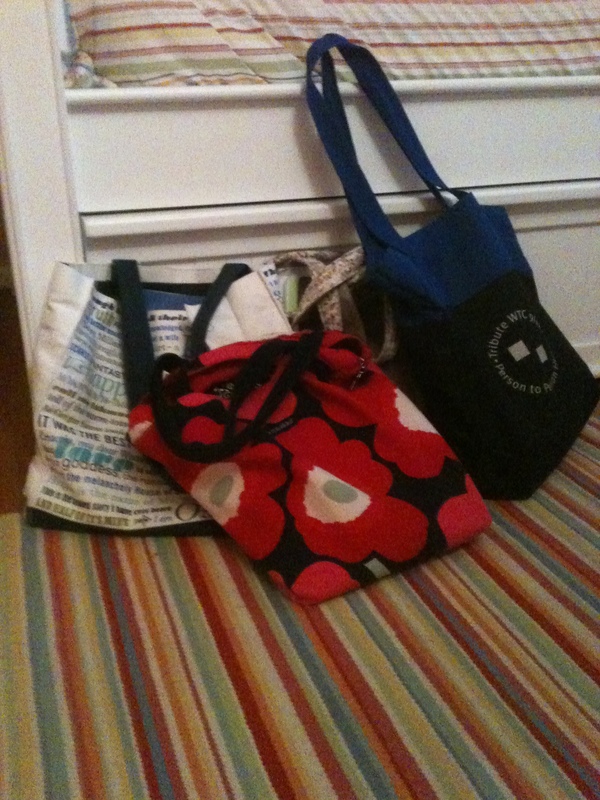 I have been a “bag lady” for years. I have a different “bag” for the different areas in my life. For me it helps to keep me organized and to not be overwhelmed. Currently I have a Tribute Center bag, a Wacky Wednesday bag, a Kids First Ministries bag, a Quizzing bag and a mom bag. Twenty years ago the mom bag would have been because I was a mom with small children but now it is because my mom is in rehab and I use the mom bag to transport her mail and laundry. Through the years I have had a dance bag, a diaper bag, a bag of tricks for entertaining children in the car, and a lunch bag. I even had a cancer bag for when I had chemo. The chemo bag had peppermints, a bottle of water, tissues, magazines and a book. That bag transitioned into a radiation bag that held aloe lotion with vitamin E. At one point in life my dance bag had my ballet shoes, a copy of Backstage, my leotard, tights, hair stuff and makeup. But through the years the dance bag changed to carry choreography notes, cassette tapes or CDs with music, new stickers for the kids at the studio, bank statements and drawings from my students. Recently I was organizing one of the closets at the Barn when I came across Buster’s old dog bowls. And I smiled to myself as I remembered Buster Brown the biggest lap dog in the world. He wasn’t a lap dog but he thought he was. He was a very tall, 130 pound Rottweiler and a great dog. When my daughters were very young, they said they wanted a dog and I told them when you are 7 and 10 we will talk about it. They must have been really young because 7 and 10 years old seemed a long way off. Well, when they were 8 and 11 years old they really started bugging us about a dog. They remembered my comment as “when you are 7 and 10 we can get a dog” – really, my girls didn’t remember when I asked them to put their toys away but they remembered that off-handed statement about getting a dog. Late one Sunday afternoon our phone rang and it was Bill. Bill had a wonderful dog named Bo who was the “dad” for a litter of Rottweiler puppies. We had been at a party together earlier in the day and I guess there had been discussion about puppies. He wanted to stop by and show us one of the new puppies. Bruce said “sure, come on by”. I gave him a weird look and he said “no problem when Bill mentions how much the puppy is we will just say we can’t afford it” which was the truth. Great, we have a plan. Well either God has a sense of humor (which I believe He does) or my kids had really been praying because what happened next was amazing and only God. Bill stops by with this adorable pure bred puppy with very big feet. He tells my kids that they can name the puppy. My girls pick Buster Brown. And then Bruce says “So how much does a puppy like this go for?” and Bill says “Free to a good home” Bruce mentions “we are going on vacation”. “No problem, we will keep him at our house until you get back.” Really!?! what just happened here. And that is how at 8 and 11 years old my girls got a dog. When my kids told my mom we got a dog, my mom thought I was having some kind of mid-life crisis because growing up I didn’t like big dogs. I told her if I was having a mid life crisis it won’t involve getting a big dog maybe a fancy car but not a dog. My dad loved Buster right a way but didn’t let on in front of my mom. My dad would say “most people don’t keep a small horse in their house”. My mom did eventually love Buster. When Buster was a year old, we went on a 5 week camping trip – our National Parks tour as we affectionately called. We were a family of 4 traveling in a Ford F-150 with a cap, pulling a pop-up trailer with New York license plates and we had a Rottweiler. We were sure most people thought we were drug dealers. There are many stories from that trip that I will share at another time. I would like to share one Buster story from that trip. We visited Bruce’s sister in Kansas. She has a built-in pool. I was out by the pool watching the girls swim and Buster was pacing back and forth. He really didn’t like that they were in the pool. He looked like “oh no, if something happens I am going to have to jump in.” When they got out he won’t let them get back in. He kept herding them away from the pool. We finally had to hold him by his collar so the girls could get back in the pool. One year a few days before Christmas, Buster pulled down the Christmas tree. The girls were watching television with Bruce and I was taking a relaxing bath and I heard “boom”. The Christmas tree had fallen over. At first we didn’t realize how it had happened but then we figured it out Buster had walked up to the tree to take an ornament off – he did that when you weren’t paying attention to him. Anyway, his collar got caught on the tree and as he pulled away the tree fell. After September 11, when there were so many different people stopping by the house to see if we needed anything or to bring food, Buster would stand between me and the other person. But if the girls walked into the room, he would go stand between them and the person. Buster took his job of being “the man of the house” very seriously. Buster died 5 years ago. He was 11 years old which is actually kind of old for such a big dog. He was a wonderful dog and a “priceless” gift to our family. Growing up “a cup of tea” with the quick fix for whatever was happening whether good or bad. My mom is British so a cup of tea wasn’t a tea bag in a mug. Having a cup of tea involved making a tray of tea. Boiling the water, heating the pot, steeping the tea and putting the tea cozy over the pot. 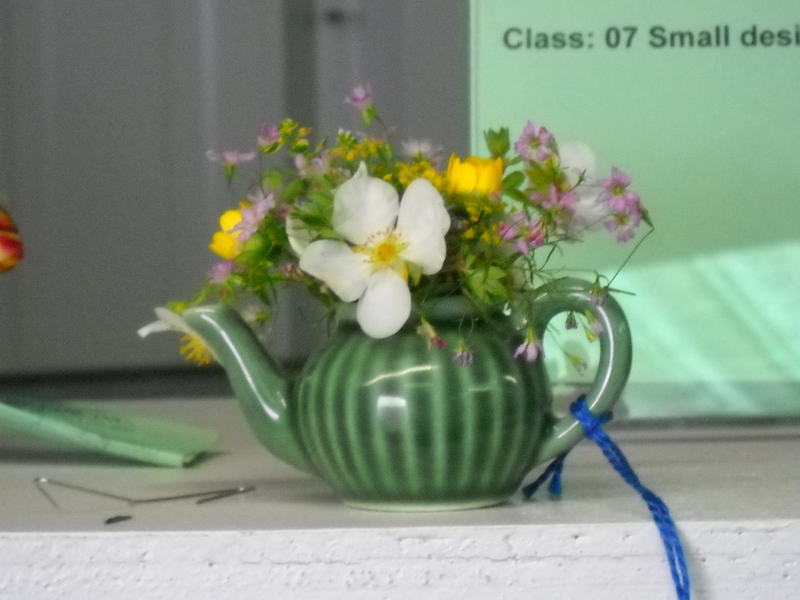 The teapot was placed on the tray with a pitcher of milk, sugar bowl, tea spoons, tea cups, saucers, napkins and biscuits or chocolates and carried to the dining room table. FYI: Biscuits or bickies is British for cookies. Sometimes even recently my mom would say “who wants to be mother” that meant you got to pour the tea. As a kid that was a big deal. My mom would always put the milk in the cup first. She told us (my brother and sisters) that she could tell when “we hadn’t put the milk in first”. I thought she could taste the difference from milk in first but I think that our faces gave away that we were trying to pull a fast one. Yes, a cup of tea could fix anything. It could calm you down or wake you up. It remains the ultimate comfort food. My mom is currently in a rehab facility. She fell and there are big changes in the months ahead. And every time I go to visit her I bring her a “good cup of tea”. It may not be delivered on a tray and the tea bag is in the cup but it is still the ultimate comfort food even if served in a cup that says Dunkin Donuts or Starbucks. I just walked outside barefoot and as I stepped outside I heard my dad’s voice say “put shoes on”. I didn’t hear his voice audibly but I heard it in my mind. My dad had a stroke 5 1/2 years ago and hasn’t spoken since but many things he used to say are imprinted on my mind. And on occasion some of those “tidbits” of wisdom have even been spoken by me. “put your seat belt on” – I have always worn a seatbelt. I have a vivid memory of my dad installing seatbelts in our station wagon. I was well into my teens before I knew everyone hadn’t grown up wearing seatbelts. “don’t believe everything you read in the paper, hear on the radio or see on the television news” – I was raised to investigate what the media says – a good idea. “write down who you spoke to, what they said and note the date and time.” This has proven to be invaluable advise. “so what do you want to do?” My dad said that to me in Sept of 1975 when I lost my job teaching dance. 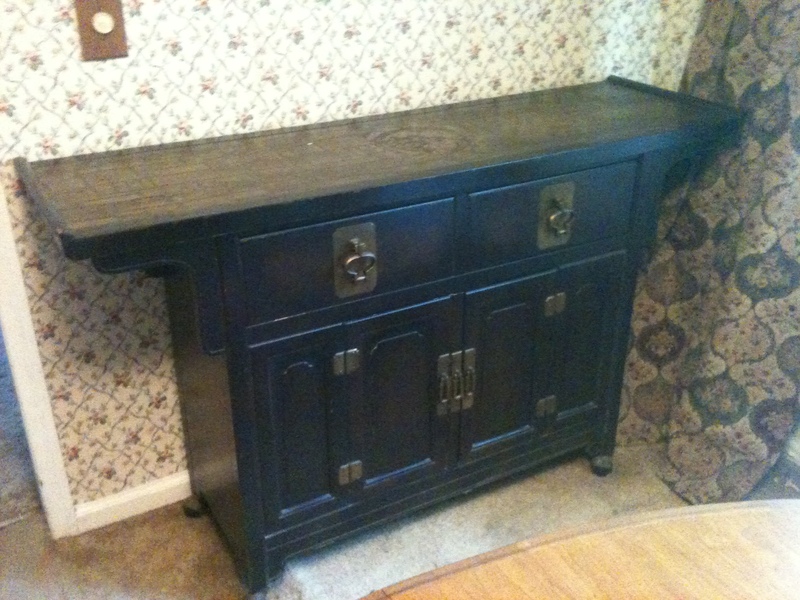 And then he set with me at the dining room table and came up with a plan. That plan was the New School of Dance Arts. “don’t drive behind big trucks – you can get sucked under” My sister, sister in law and I drove cross country in a Pinto in August of 1981. My dad made us put a crowbar under the seat to “pry ourselves” out of the car. My sister was moving to California and we drove her car and my sister in law and I flew back – one week trip. oh my!!! “Kids need to learn geography” – thus why I own a globe and an atlas. “good show” – my dad came to every one of my recitals. “Promise me you won’t make any major changes in your life for one year” He said that to me after Sept 11, 2001. I believe in prayer and I am grateful that I live in a nation where I have freedom of religion. I realize that if I lived in some other countries on our wonderful planet I would not have freedom of religion. I also realize that there are people who do not share my views on life and religion in particular. And I am good with that. The world is a big place and we are all different. As I always say to the kids “It would be so boring if we were all alike.” I love the diversity of the United States but I will say that I don’t like the term “tolerance”. I think “respect” is a better word. I get the concept of tolerance but wouldn’t respect be better. I don’t have to agree with your lifestyle or beliefs to respect you as a fellow member of the human race. Can’t we respectfully agree to disagree. See the bottom line is you haven’t walked in my shoes and I haven’t walked in your shoes. But I can almost guarantee that there is something you can teach me about life that I wouldn’t have known if I didn’t know you and visa versa. We don’t have to see “eye to eye” to walk “hand in hand” or live “side by side”. One last thought for my brothers and sisters in Christ as John Wesley stated: “On the essentials, unity; on the non-essentials, liberty; and in all things charity(love).” Amen!